Amazon has launched new Charts designed to reveal the most popular books available to read. The online retailer has always offered a list of bestsellers, but these new charts draw in data from a number of sources to give a more accurate picture of what books people are actually reading. Amazon started life as an online bookseller. So it isn’t surprising that the company loves selling books. This is why Amazon has acquired both Audible and Goodreads An Unofficial Guide to Goodreads for Readers and Writers An Unofficial Guide to Goodreads for Readers and Writers I am digital marketer who works in traditional publishing, and I am also a writer. And though I am not self-published, I have two words for those who are: Goodreads STAT. Read More over the years, and created the Kindle ecosystem. And now it’s using new charts to fuel our addiction to reading books. 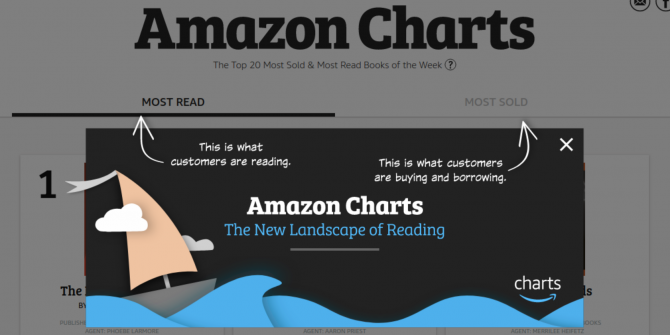 Amazon has launched two new charts it calls simply Amazon Charts. These charts track what books people are buying, reading, and listening to across all of Amazon’s various properties. They then offer interesting notes on each title, plus links to customer reviews and reading samples. The Most Read chart refers to “what customers are reading”. It orders titles according to “the average number of daily Kindle readers and Audible listeners each week”. However, “dictionaries, encyclopedias, religious texts, daily devotionals, and calendars” are all excluded from charting. The Most Sold chart refers to “what customers are buying and borrowing”. It orders titles according to “the number of copies sold and pre-ordered through Amazon.com, Audible.com, Amazon Books stores, and books read through digital subscription programs”. The new Amazon Charts will change every week as new data is processed, giving us all an accurate snapshot of the books everyone else is reading. Crucially, it no longer matters whether people are buying books, listening to audiobooks, or reading books included in subscriptions. This is a positive move from Amazon, with the online retailer reflecting the way people are actually consuming content these days. Amazon’s aim is, rather obviously, to get us all buying more books How to Read 50+ Books This Year How to Read 50+ Books This Year If you're like the average American, you're not reading enough. Reading more books can make you smarter and more successful. Let us show you how to read one book per week. Read More , but that’s something all of us who see the value in reading should get behind. Do you buy your books from Amazon? If so, why? Is it all about the pricing? Do you own a Kindle and buy eBooks? Do you listen to audiobooks? Can you see yourself using these new Amazon Charts to make purchasing decisions? Please let us know in the comments below! Explore more about: Amazon, Amazon Kindle, Audible, Audiobooks, Ebooks, Goodreads. Yes, i buy books from amazon. It is very easy to get books and reliable too. Flat file CMS is the way to go for simple sites. It's light and there aren't many moving parts. I found Bludit to be the easiest one to install, edit, and do stuff generally (tried others like Grav too but a little complex).